Beef chuck gives a good beefy flavour to a stew. Ask your butcher for a cut of chuck that is from the fattier neck portion of the chuck so that the meat is extra moist. Garnish the dish with chives and serve with sour cream if you like. 1. Heat a Dutch oven or medium stock pot over high heat and add the bacon. Render the fat and cook until the bacon is crispy, about 7 minutes. Remove the bacon and drain. Reserve. 2. Coat the beef with the flour, salt and pepper. Brown the beef in the bacon fat on all sides, being careful that the meat doesn’t scorch. Remove from pot. Reserve. 3. Using the same pot, reduce the heat to medium and add the vegetable oil. Add the onion, cremini mushrooms, carrot, celery and garlic. Use a splash of beer to deglaze the pot. Loosen and scrape all the brown bits sticking to the bottom of the pot. Sauté the vegetables for 4 minutes or until the vegetables brown and begin to soften. Add the molasses, caraway seeds, paprika, mustard seeds and salt and pepper. Return the bacon and beef to the pot. Add the beer and stock and bring to a boil. Reduce the heat and simmer and partially cover the pot. Occasionally skim the foam from the top of the stew. After 45 minutes of cooking time, add the potatoes. 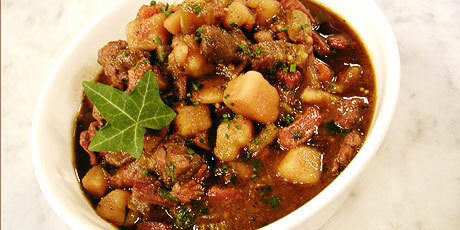 Continue cooking stew for another 45 minutes or until the beef is tender and the potatoes are fork tender. Garnish with fresh chives and serve.